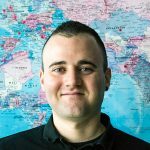 Born and raised in France, I grew up exploring the country with my family. The French countryside has much to offer both local and international travellers in the way of culture, history and natural beauty. I’ve put together a list of 16 towns and villages that stand out for their unique features. If you‘re thinking about exploring places beyond Paris or Nice, here are some of the best lesser-known destinations you should visit in France. Click on the links right below to jump to the region. You can also view an interactive map below to help you plan and navigate between the little French towns, whether you plan to fly or rent a car and drive to your destinations. Explore the French countryside by region and tour the interactive map below! If you’re looking for picturesque towns in France, take a trip to Étretat: a cute little village in the Normandy region built in the middle of a mind-blowing landscape. You’ll spend hours walking along its beautiful pebble beaches and majestic white cliffs, surrounded by striking rock formations. While exploring the town centre, keep an eye out for half-timbered houses, old fishing cottages and other medieval buildings. Treat yourself to one of the many creperies in town for a well-deserved break after a long walk. But if you want to sit down for a proper French meal, the restaurants in Étretat serve the freshest seafood. 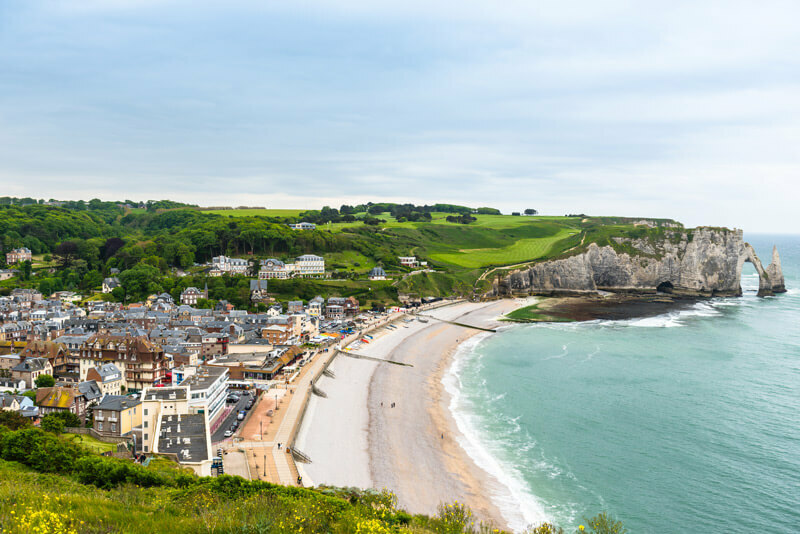 The picture-perfect town of Étretat. 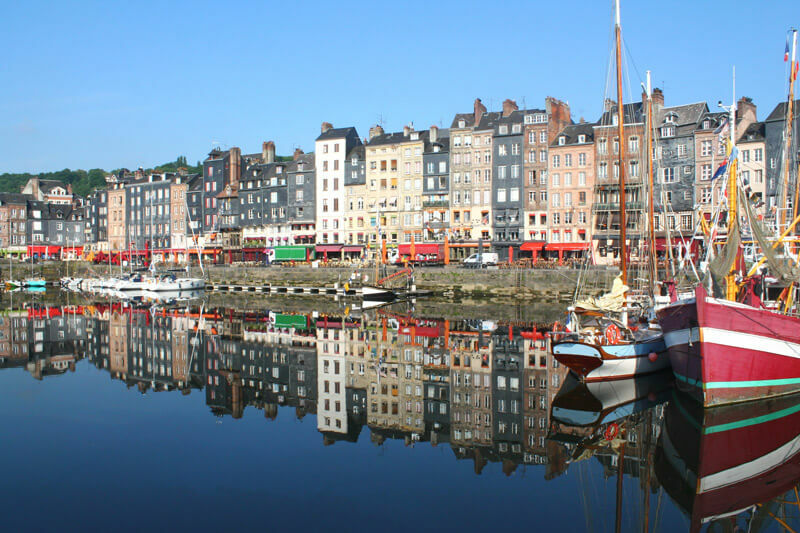 A gorgeous harbour in Northern France, Honfleur is the perfect combination of Normandy and the Netherlands—the yachts docked at the old port in front of old brick buildings will remind you of Amsterdam! Thanks to its coastal location, the town has the freshest seafood, so be sure to indulge in some moules frites and sample local products at the outdoor market on Saturday mornings. A hike up the trail from town to Mont Joli will treat you to a panoramic view of the town below. The old port of Honfleur. 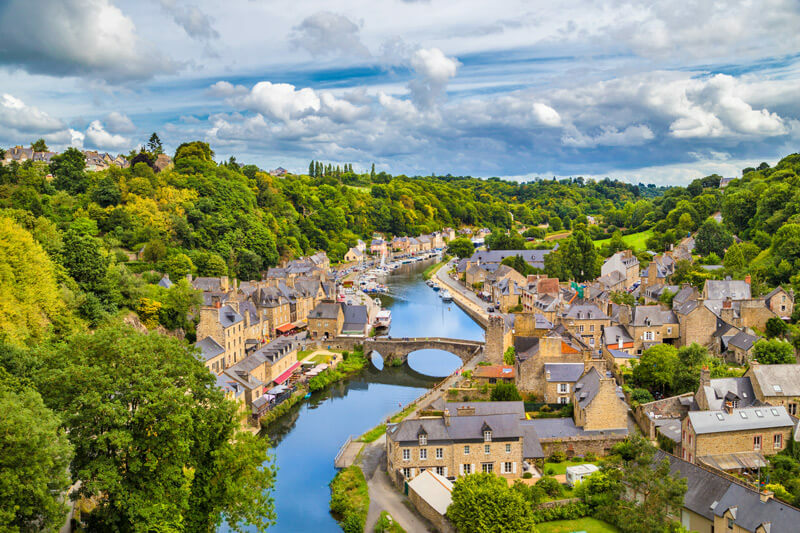 Dinan is unquestionably one of the most beautiful villages in France. This medieval town crossed by a river is a setting worthy of a fairy tale. Take a journey through time as you stroll through narrow streets, or walk along the river and the rampart walls. In the town centre, you’ll find many craft shops belonging to sculptors, glass blowers and engravers. Some of the buildings date as far back as the 13th century. The beautiful town of Dinan. 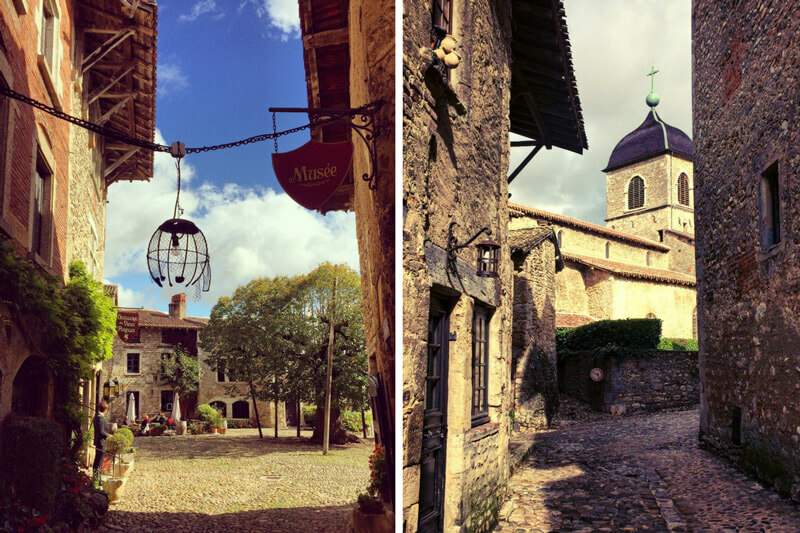 If you’re looking for beautiful towns to visit near Paris, you can take a day trip to Courances. While only an hour away from the French capital, it’s the perfect escape from fast-paced, sometimes hectic big city life. You’ll be impressed by the 17th century castle and peaceful gardens by the water. This is a great alternative to the touristic Versailles, offering the ideal scenery for a relaxing stroll! The castle of Courances, near Paris. A calm little village seemingly lost in nature, Pierrefonds is the perfect French countryside town to unwind and unplug from the rest of the world. Famous for its imposing yet impressive castle, you can learn about its interesting history, which dates back to the 12th century. Many trails around town lead to the relaxing backcountry, perfect for a serene walk in the woods. The castle of Pierrefonds dominating the village. 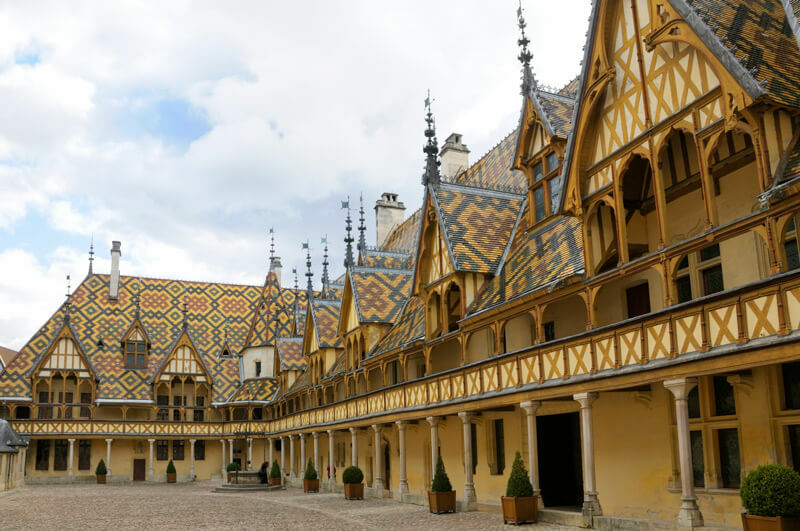 Found in the heart of the Burgundy region, the charming town of Beaune will win you over with its picturesque old streets and rural landscapes. 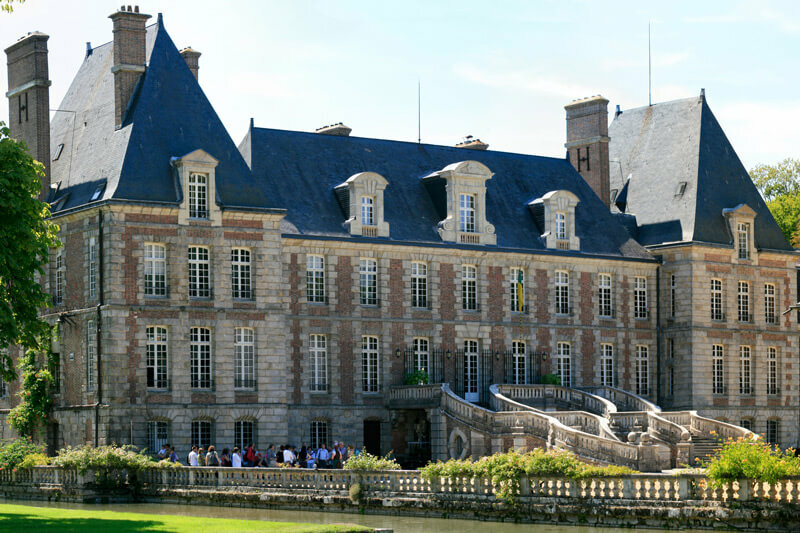 Be sure to check out the peculiar architecture of the Musée de l’Hotel Dieu, a former 14th century hospital converted into a retirement home. It makes for a good starting point if you want to go on gastronomical excursions in the wine region, or take day trips to explore nearby cities like Dijon. Every third weekend of November, Beaune holds an annual wine auction that draws both wine lovers and connoisseurs from all over the country. Mark your calendars if you fall under either of these categories! The unique architectural style of the Musée de l’Hotel Dieu. Over 50,000 flowers and plants bloom every year in the medieval streets of Chatillon sur Chalaronne, which makes it one of the prettiest towns in France. In fact, Chatillon has won the national title of ‘Best Flowered Town’ many times. Follow easy hiking trails along the corn fields, find French Medieval history at every corner, or shop for local specialties under Les Halles. 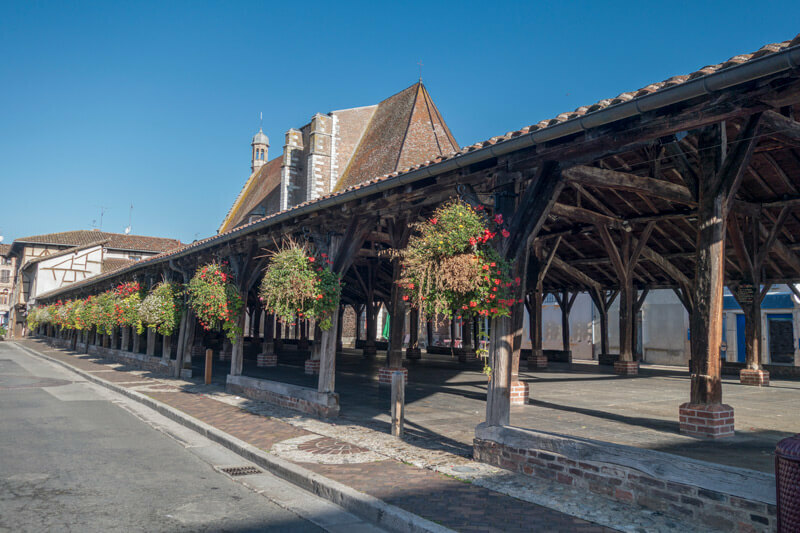 This outdoor market opens on Saturday mornings and is known for its arcade-type structure built in 1440, once voted one of the most beautiful markets in France. Chatillon is also in Dombes county, a region renowned for its concentration of Michelin-starred restaurants! Les Halles hosts a local product market every Saturday morning. Only half an hour away from the beautiful city of Lyon, Pérouges is one of the most well-preserved medieval towns in France. The village, perched on a hill, appears to be unaffected by time: still demarcated by its original fortified walls, brimming with cobbled-stone houses and streets, with stores displaying no modern signage. Try to visit the old church while you ‘re there. Though not as grand as most other European edifices, its ancient feel will leave you dreaming about another time. Make sure to try tarte au sucre, a local sugar tart specialty—simple, but delicious. Escape time in the narrow streets of Pérouges. 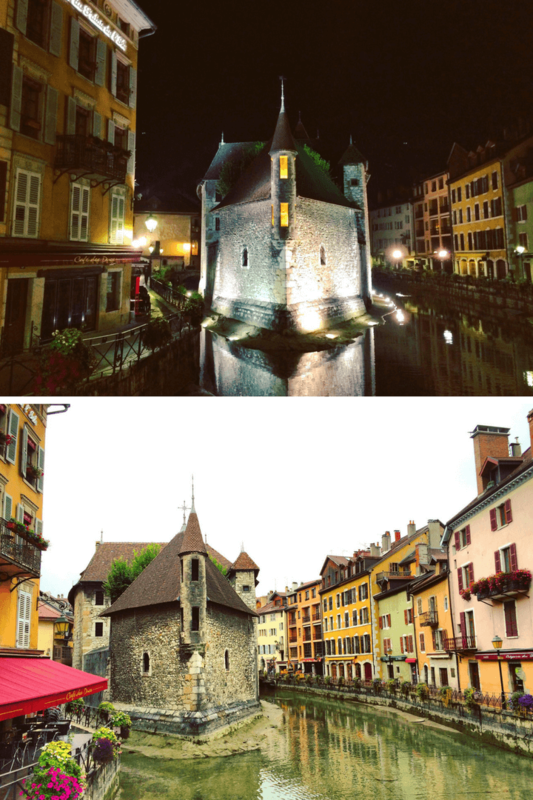 Annecy is one of the most charming small towns in France. It’s rich in culture, history and food. Located in the middle of the beautiful mountainous area of Savoie, this Alpine town is filled with pastel-coloured houses and winding canals. You could spend a whole day strolling through the Old Town’s spiraling cobbled streets while shopping for sweet treats or souvenirs. Make sure to check the Palais de l’Isle, a former prison built in the 12th century that has since been converted into a museum. If you’re in the mood for some French comfort food, the town’s many restaurants specialize in copious cheese-based dishes. In the summer, you can hang out by the lake and admire the astonishing view. The “Palais de l’Isle” by day and by night. 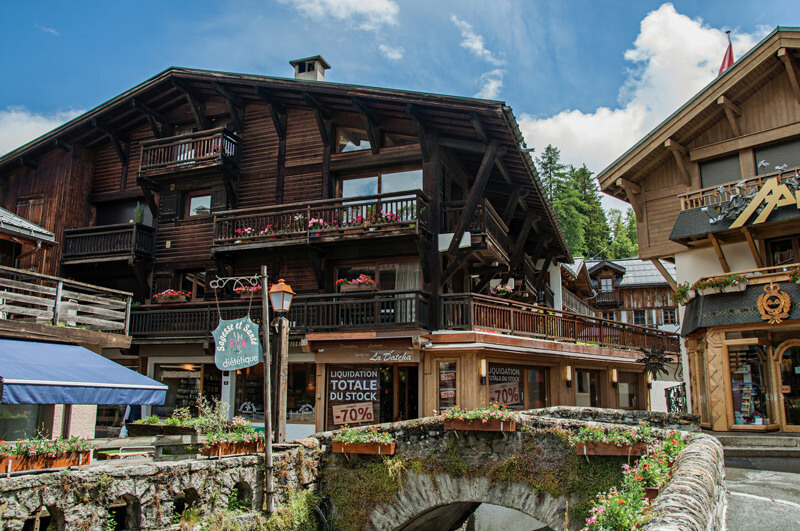 A popular ski resort in the winter and a favourite hiking destination in the summer, Megève is one of those French mountain towns to visit if you’re into stunning alpine sceneries. You can follow the many forest and mountain trails and take deep breaths of pure air as you soak in the beautiful surroundings. There are also many boutique stores and upscale chalets for you to chill in after your hiking adventures. Megève features a lot of comfortable mountain chalets. Hidden in the middle of a rugged landscape, this isolated small French town is worth the journey there. On your route, spend a day driving through the Parc du Pilat, a natural park full of forests, mountains, vineyards and hidden little medieval villages. Once in Puy en Velay, hike up to the Chapel Saint-Michel d’Aiguilhe, where the endless stairs reveal a spectacular scene. 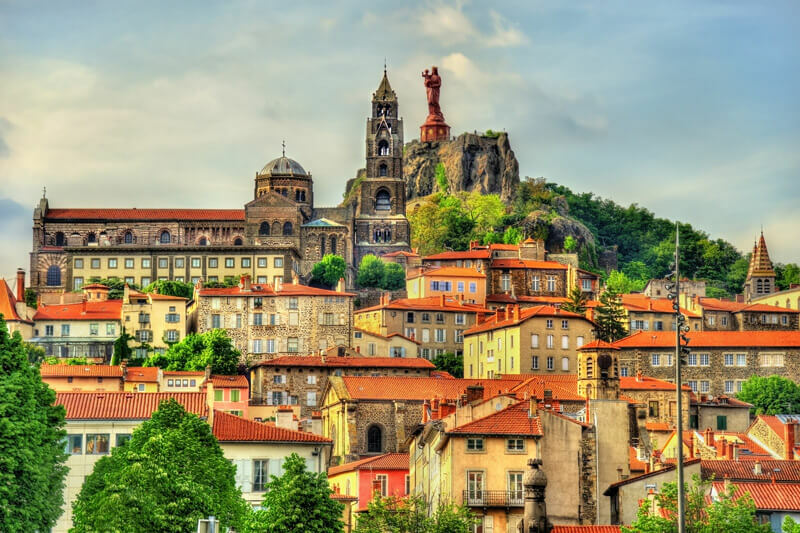 Le Puy may be a small town, but there are many other sites to visit in the vicinity. If you can spare it, take a 10-minute drive to the castle of Polignac. The town of Puy en Velay, perched on the hills. 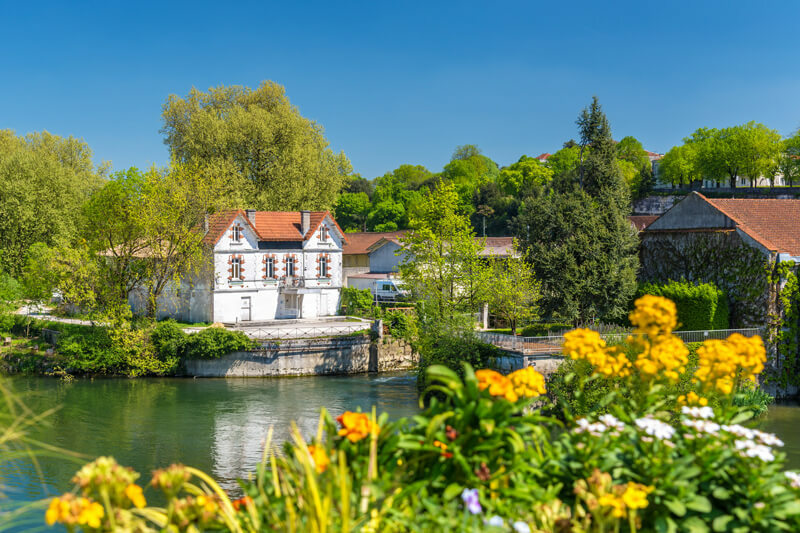 A quiet little town bordered by the peaceful Charente river, Cognac is known for its wine country and, most importantly, its world-famous brandy. This is the perfect stop for connoisseurs looking for a relaxing stay, paired with tastings and educational sessions about the prized orange liquor. If you also want to do some sightseeing in between glasses, visit the Chateau de Cognac, a 15th century fortification by the Charente river. The banks of the Charente River. 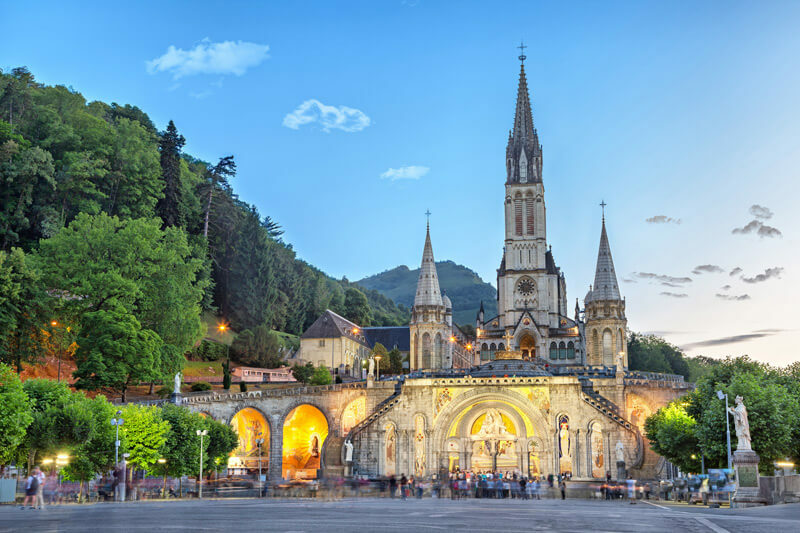 Situated at the foothills of the Pyrenees mountains, Lourdes is a pilgrimage destination visited by millions of people around the world. The Virgin Mary was said to have appeared to a local woman in the Grotto of Massabielle (also known as the Grotto of the Apparitions) 200 years ago. Since then, the town has become a centre of attraction for people of all beliefs, in their quest for spirituality or a miracle to change their lives. At night during the pilgrimage season, visitors sometimes gather at 9PM in front of the grotto to sing “Ave Maria” in chorus. Some nights, the town is illuminated by torch processions, giving a truly unique experience! The Rosary Basilica in Lourdes. Enjoy the posh vibe, fun nightlife, fancy dinners and cocktails while the sun sets over the Mediterranean Sea in the background. Or go snorkeling, walk along the palm trees, and relax at a private beach. 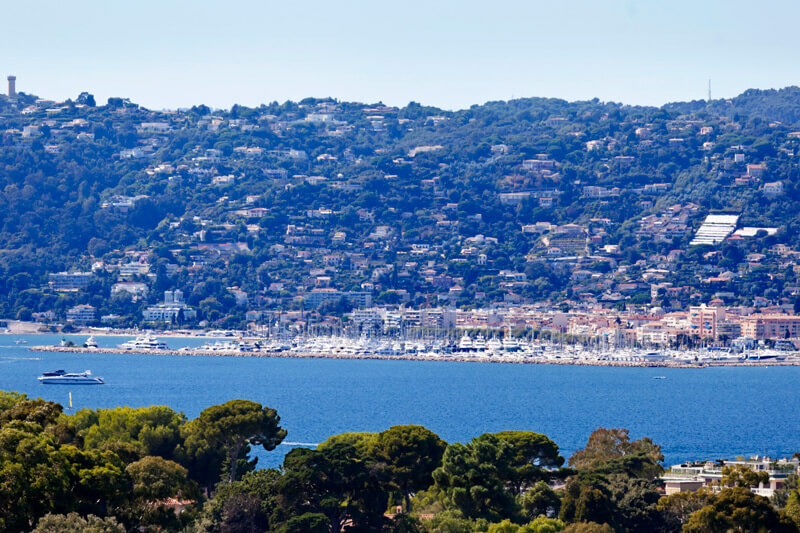 Juan les Pins has all the perks of Cannes, but with less tourists. But if you really want to visit Cannes, it’s only a few kilometres away. The Musée Picasso, built on the foundations of the ancient Greek town of Antipolis, is a great stop if you want to see where the famous painter used to work. The gulf of Juan les Pins. 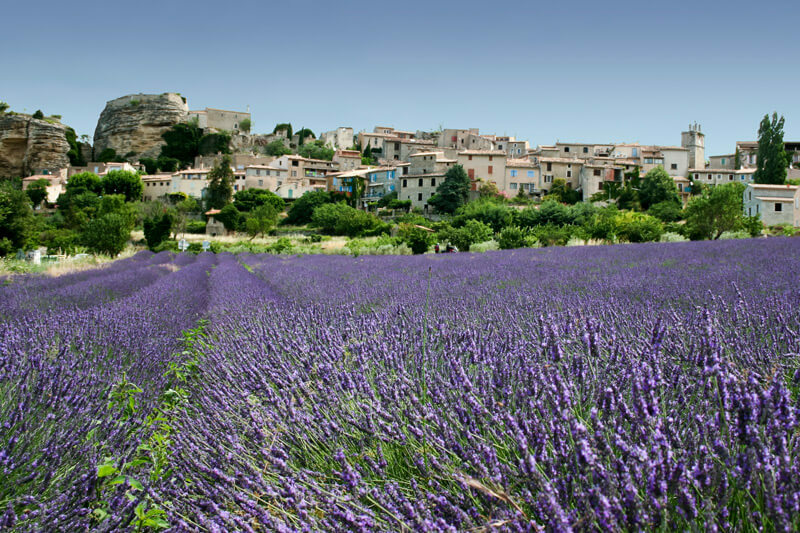 One of the world’s leading producers of fragrances in the perfume industry, Grasse is another great stop if you’re wondering where to visit in the south of France. The town is surrounded by vibrant fields of flowers. You can visit workshops run by world-renowned perfume makers and take a tour to learn how perfumes are made. If you’re fond of the painter Rubens, go to the Grasse Cathedral in town to see some of his original artwork. Fields of lavender around the beautiful town of Grasse. 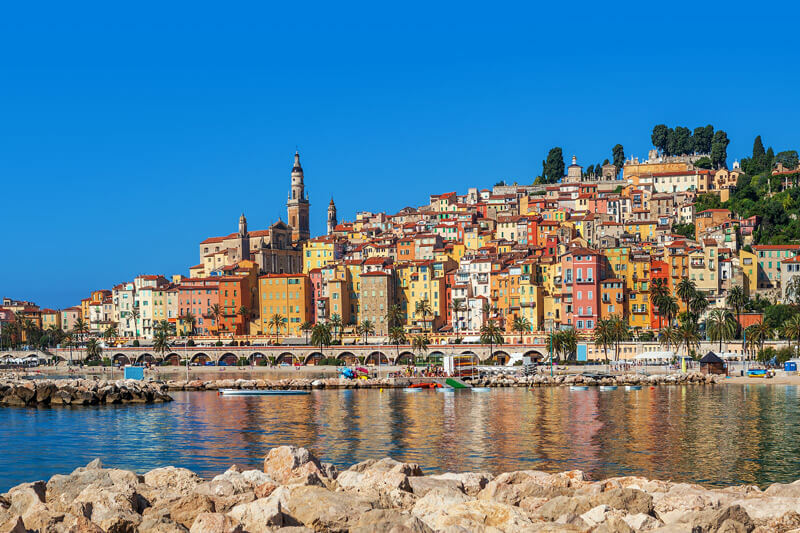 Located between the Mediterranean Sea and the mountainous Italian border, Menton will take your breath away with its picture-perfect colours. It’s arguably the best coastal town in France. Alternate between down time at the beach and exploring all the beautiful streets and small monuments the town has to offer. The scent of citrus, enchanting sound of chiming bells, views from balconies overlooking the infinite blue, and distinct taste of the southern French cuisine all blend with your senses in Menton—the French Riviera at its best! The colourful town of Menton. I hope this little ‘tour de France’ made you want to pack your bags and book a flight to France. 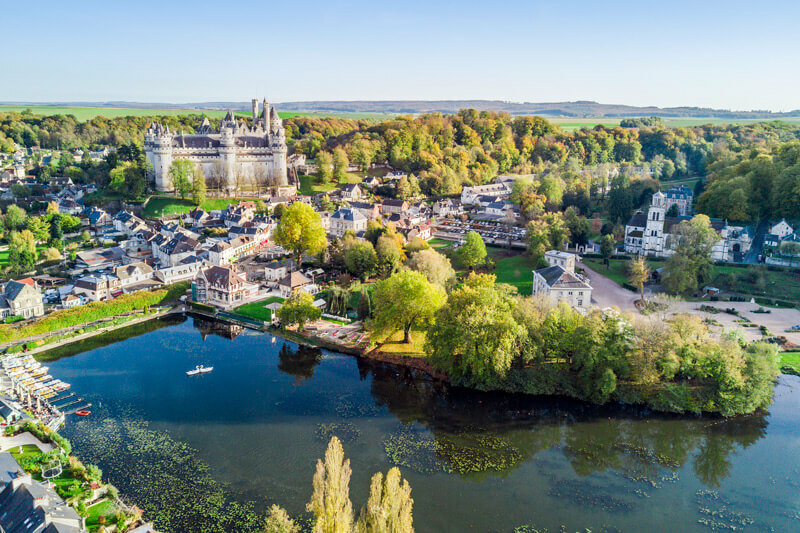 As you can see, the little towns and villages beyond typical French destinations all give France its rich and diverse character—travellers will be rewarded by exploring them! And don’t forget to buy travel insurance before you leave.